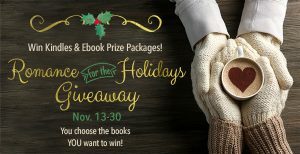 Enter our Kindle & Ebook giveaway where SEVEN lucky winners get to take home some holiday loot. Prizes include Kindles and Ebook Prize Packs where you choose the books you want to win. And while you’re stopping by, pull up a cozy chair next to our virtual fireplace to shop for your next read at our Holiday Book Fair. Many titles 99 cents or FREE. Find your next read here.